Supposedly Brett Favre has underwent shoulder surgery. This procedure was said to have occurred last month. This was the very same surgery that he retired from the Jets in order to avoid. The news of this surgery has come through ESPN’s Chris Mortensen and Ed Werder, who say they have separate sources who reaffirm this story. I am not entirely convinced. This would not be the 1st time that these Media whores have fibbed in order to heat up attention on their top off season story. Also, how does Brett Favre, who has the media following him around this entire off-season pull off a surgery last month. I know arthroscopic surgery can be a very simple procedure, but wouldn’t the media have known about it? Wouldn’t the Media have noticed considering they are stalking him? I mean this guy has media trucks and people outside his house, following him wherever he goes. I do think they would have noticed a surgery! 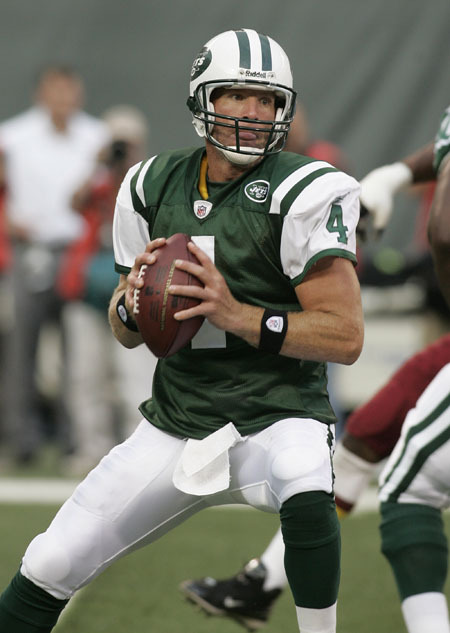 Mortensen and Werder have also reported that Brett Favre is only waiting to heal and then he will sign with the Vikings. They are stating that the only reason he has not signed is because the shoulder isn’t 100% yet! This is big news even if it is a bold face lie! So keep watching the Favre situation because something just might happen soon! Tagged: Brett Favre arthroscopic shoulder surgery, Brett Favre could sign soon, Brett Favre Surgery, Brett Favre's shoulder, When will Brett Favre sign?, Will Brett Favre play for the Vikings?